Surf the Web Peacefully with Adlesse - No More Annoying Banners, But Only Custom Widgets in Place of Them! Tech-Wonders.com » Software » Surf the Web Peacefully with Adlesse – No More Annoying Banners, But Only Custom Widgets in Place of Them! Surf the Web Peacefully with Adlesse – No More Annoying Banners, But Only Custom Widgets in Place of Them! 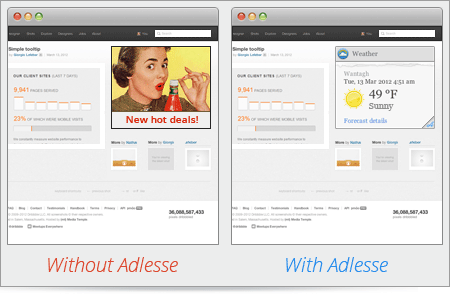 Adlesse.com Company has announced the first release of its namesake product, Adlesse for Windows – a free browser add-on developed for those who are fed up with banner ads on the web. Adlesse replaces banners with its original widgets showing useful content instead of ads. Widgets available includes Facebook feed, local news, weather forecast, latest tweets and more. All popular browsers are supported. It is completely ok to be irritated by banner ads, and the wide majority of Web users think the same. However, it’s desirable to do something about obtrusive advertising, since constant annoyance while surfing the Internet can be harmful to mind and body. The most common way to cope with banners is to use some add-on that simply eliminates ads, but why not replace them with something bringing use and joy? That is how Adlesse functions – it substitutes all the disturbing banners for useful widgets of the same size: local news, latest tweets of your Twitter friends, Facebook news feed, local weather (current conditions and weather forecast), interesting facts, famous people’s quotes, upcoming holidays. Adlesse helps the user to stay in touch with recent information while peacefully surfing the Web. Moreover, Adlesse improves Google search, adding alternative search options, by Bing, Twitter and Wikipedia. It works with all popular browsers, such as Mozilla Firefox, Google Chrome, Internet Explorer, Opera and Safari. By the way, the user is free to customize Adlesse settings, choosing which widgets to display and how often. The list of widgets will be expanded according to the users’ requests. To sum up, Adlesse for Windows is a neat ad blocking tool that incorporates features of several handy add-ons. It is easy to use and to customize, its widgets look elegant, and its efficiency is proven. And, besides, Adlesse is absolutely free of charge! Replacing ads with useful widgets. Latest tweets and Facebook news. Local news and weather reports. Random interesting facts, famous quotes, upcoming holidays and interesting links. Compatibility with Mozilla Firefox, Google Chrome, Internet Explorer, Opera and Safari.